Home » Category: "Home Page"
Sunshine-filled days are meant for exploring historic destinations, leisurely afternoons on the green, and relaxing on the patio for drinks with friends. Start the season off right with one of these must do Spring excursions in the Tri-States. Take a ride up the world’s shortest and steepest railway at the Fenelon Place Elevator in Dubuque, Iowa. This bucket list destination is the perfect junket for any traveler regardless of age. Scale up the steep bluff overlooking Cable Car Square and take in the widest view of historic downtown Dubuque and the Tri-State region. Now open through November 30 for the 2017 season, the elevator is a great option for budget friendly and historical. Tee up for a day on the green at Eagle Ridge Golf Course in Galena, Illinois. Soak up some Vitamin D while you cruise through 63 holes laid out over four recently renovated courses. This PGA award-winning course is full of challenging fairways and relaxing woodlands suitable for any skill level of golfer. Book a tee time for your Spring getaway today, now open through late Fall of 2017. Taste some of the finest wines of the Mississippi River Valley at Whispering Bluffs Winery in Potosi, WI. Situated high atop the bluffs, it is home to the perfect vineyard setting with rich sun exposure and shelter from the cold winds where over 1100 grape vines grow. Make a tasty day by pairing your winery trip with a quick trek across the street to the Potosi Brewery. Whispering Hills is currently open Wednesday through Sunday with the option for private events. With Halloween, just around the corner, pumpkins are in great abundance. Whether you are carving a scary ghoul, preparing a favorite pumpkin treat or looking for a family excursion, the Tri-State region has you covered for last minute pumpkin picking. Appetites are evolving here in the Tri-States. We’ve said goodbye to our hydrating watermelons and charred burgers on the grill and moved onto soul warming Autumn treats. Get a taste of what the season is all about at one of these three tasty fall festivals happening in our backyard. Sip, sample, and savor the weekend away at the Fall Harvest Celebration in Montfort, Wisconsin September 30 – October 2, 2016. Taste some of the most unique popcorn flavors your tongue will have ever enjoyed. Indulge in Cherry Cheesecake popcorn, a sweet mingling of creamy cheesecake fudge-dipped cherry flavored popcorn with cherry jelly beans or splurge on some of Rural Route 1’s wildly popular Cheesy Jalapeno popcorn for an extra kick. That’s not all. Peruse handmade artisan pieces, sip on piping hot cider, and so much more. Get some good eats at largest seasonal soup festival in the region, Tri-State’s Largest Chili Cook-Off in Dubuque, Iowa on Saturday, October 1, 2016. Sample savory chilies made on site and judged at this Chili Appreciation Society International event in the Historic Cable Car Square. Enjoy live music by local favorite, the Lonely Goats, as you digest a warm chili food baby alongside the picturesque fall foliage filled bluff. Saukerkraut, brezel, and a wurst. No fall celebration is complete without good ole’ German Oktoberfest in Galena, Illinois on Saturday, October 1, 2016. Eat, drink, and be merry at this 10th annual event with non-stop live music, wiener dog races, polka lessons, of course an endless supply of German grub and beer. Taste your favorite fall brews at the Potosi Brewing Company’s rolling bar and take part in this time-honored tradition because admission is FREE! Don’t let the weather keep you from experiencing winter in the Tri-States. Check out these four outings perfect for a snowy December day. Have you been itching to hit the slopes? Now is your chance. Conveniently located outside Galena, Il, Chestnut is the perfect place for all levels of skiers and boarders alike. Enjoy 19 runs at this beautiful resort overlooking the Mississippi and be sure to stop at Mountainside Outfitters for all your gear needs! Cinema at the Figge. Enjoy this free event sponsored by Ford Photography. Enjoy a complimentary beer tasting and snacks, followed by short film and tunes before the feature film begins! The holiday time is also about giving, all donations during this event will go to charity. December 15, 2016, 5 P.M – 9:00 P.M.
Santa Claus is coming to the museum! Join the museum to learn about Santa’s evolution from austere bishop to jolly St. Nick and enjoy a 14′ Victorian Christmas tree, toy trains, and children’s activities. Program at no cost to the public from December 3 – 31, 2016 during regular business hours. Enjoy one of the largest nature preserves in the Midwest. Swiss Valley boasts over 10 miles of nature trails that pass through forest, prairie and wetland areas. Embrace this serene season and snowshoe through the cross-country ski trails at no cost! Free rentals available throughout winter. Adventure #1: The little incline. Imagine this. You climb in a little green and white rail car. You begin your travel 189 feet into the air. Halfway through your ascent you pass an identical car filled with a family laughing and smiling. You arrive at the top, climb out of the car and then you see it. You see into three states, a riverboat cruising on the Mississippi River and people walking the streets below. One of the kids waiting excitedly in line to take the same climb waves at you and you wave back with a huge grin. You look back out to take in the magnificent view of downtown Dubuque and the Mississippi River from the top of the Fenelon Place Elevator. You have just ridden the world’s shortest and steepest scenic railway. Adventure #2: From Italy to the Midwest. Seventeen years old and hearing the call to the Priesthood, Father Samuel Mazzuchelli’s began his journey. While studying in Rome, he felt called to the American missions and spent 40 days on a ship before reaching America. His work began in Michigan before proceeding south and settling in the Tri-State area. Not only did he preach to the local people and appreciate Native American’s values, but he built schools and churches along the way. One of the few remaining buildings built by Fr. Mazzuchelli can be found at Sinsinawa Mounds. Today, the Dominican Sisters continue Fr. Mazzuchelli’s mission and honor him with an artifact exhibit on the grounds. Adventure #3: M for Mining. Here is another Tri-State world record holder for you – the world’s largest “M”! Now over 75 years old, the rock formation continues to welcome visitors who climb its 166 steps and take in the view from the top. Located in Platteville, Wisconsin, this giant letter is 214 feet wide and 241 feet high. As history tells, a snow “M” inspired the permanent white rock “M”. Using an estimated 400 tons of limestone, students created a lasting symbol to represent the mining heritage of the area. Grab a bottle of water (or two) and a picnic lunch, take a hike up the 166 steps and enjoy the beauty of Wisconsin. Have you tried the cheese that squeaks yet? Even if you have, plan to make a stop to pick up some fresh cheese curds. Try a new flavor or pick up your favorite! Shullsburg Cheese Store has a variety – from classic Cheddar to the Chipotle to Dill. There is sure to be a flavor to satisfy you during your snack attack. Happy Squeaking! It was the spring of 1860 when Ulysses S. Grant and his family decided to make the move to settle in Galena, Illinois. He worked in his father’s store and traveled to small towns servicing customers. At the outbreak of the Civil War in 1861, Grant rejoined the U.S. Army and was commissioned colonel. Four years later, Grant returned home a war hero and to a new fully furnished house as an appreciation gift. Grant went on to become President and his children gave the house to the City of Galena. The home has been restored to its original appearance from Grant’s time there. Take a jump back into history as you tour through President Grant’s home. As the fleeting and chilly winter days are ahead of us, take a moment to find the charming and cozy places of the Tri-States. Plan to make a trip to one of the five spots to stay warm this season. Even though the thought fresh powder on the ski hill may not make you feel physically warm, it certainly will warm your soul. Check out the Ski, Stay & Dine Package available now through March 16, 2019 at Chestnut Mountain in Galena, IL. Learn More. Pamper away winter with a stay at Eagle Ridge Resort & Spa in Galena, IL. Rent a little villa for a weekend escape and kick back with a massage. Learn More. Nothing makes you feel quite as cozy as a hot cup of coffee. Stop in at Inspire Cafe in Dubuque, IA for a spot by their fireplace in a space full of community and connection. Learn More. Warm your soul with the flavors of the south at Flatted Fifth Blues & BBQ at Potter’s Mill in Bellevue, IA. Not only will you leave with a belly full of warming Gumbo, but you can also get yourself some hot beignets at the new art gallery and coffee shop, A Corner to Fill at Potter’s Mill, just two flights of stairs up. Learn More. Escape to Switzerland…or New Glarus, WI for a weekend bundled up at the Chalet Landhaus Inn. Enjoy the Swiss-style dining with locally made cheeses and sausages, plus all the charming hospitality. Learn More. Spring has sprung, and the winter weather is slowly fading away. As the days get longer and the weather warms, travelers will begin to flock in. Here are a few of our favorite spots that will be sure to get you and travelers in the spring spirit! Even though the hills are no longer covered in a blanket of snow there is still plenty to do and see at Chestnut Mountain. Make a stop at the sunset grille overlooking the Mississippi River and enjoy a glass of wine and their signature dishes. Then take a ride on the Soaring Eagle Zipline or enjoy a scenic view on the chairlift. Looking for a quick getaway? Enjoy a relaxing night or two at the Grand Harbor Resort and Waterpark situated along the Mississippi River. Enjoy the pool, take a scenic walk along the river and take advantage of all the attractions within walking distance including the National Mississippi River Museum and the Diamond Jo Casino. Experience the sweet sounds of Jazz paired with the flare of their southern dishes in the heart of Bellevue, IA. This restaurant features southern charm and an experience you won’t want to miss. Need some fresh air? This 10-acre city park is located on the bluff in East Dubuque overlooking the Mississippi River. As an Illinois Natural Heritage Landmark, this site is home to 26 ceremonial and burial mounds from the Hopewell Native American Culture. This quaint town situated along the Mississippi River hosts a multitude of charming shops, outdoor activities and family fun all year long. For the outdoor adventure seekers, bird watchers, and for cultural experiences, this is the place to be! The Tri-States are abundant in rich culture, breathtaking views, and award-winning establishments just waiting to be discovered by you. From delectable dining and sweet treats to internationally-acclaimed wines, there is no shortage of fine tastes to choose from along the mighty Mississippi river. Home of the famous Gremlin Bar, Betty Jane Candies has been an institution in Dubuque, Iowa since 1938. Known for their melt-in-your-mouth homemade chocolates, Betty Jane’s has been named one of the Top Chocolate Shops in the Nation by Taste of Home, in addition to having their candies included in both the Grammy and Academy Awards Gifts Bag. Make sure you stop in and see why these chocolates are sweeping the nation. The sounds and smells of Memphis and New Orleans collide at this truly unique award-winning restaurant in Bellevue, Iowa. Having only been open since 2014, this venue has made quite a name for itself on the national foodie scene. With being named The Must Eat BBQ Restaurant in Iowa by Southern Living Magazine, The Coziest Restaurant in Iowa by Food & Wine, and most recently the winner of Mac & Cheese Fest Dubuque, it’s easy to see that this BBQ joint is a must on your next road trip. Tucked into the bluff country of western Illinois, Galena Cellars Vineyard & Winery is making a splash in the international wine world. Being a multi-Gold Medal Winner at the 2017 Indy International Wine Competition was just the icing on top of a banner year in addition to winning Best of Show at the 2017 Illinois State Fair with their Secret Garden Viognier. Take a trip across the river for an easy summer afternoon just drinking the day away. Bright twinkling lights and luscious green garland fill the Tri-States as we make way towards the holiday season. Don’t miss out on the opportunity to see this magical Mississippi River region blanketed in holiday goodness at these stand out events. Take part in the holiday traditions of Stockton, Illinois on Saturday, December 2, 2017. Bring the family for story hour with Santa at the library, ride in a horse-drawn carriage, plus Bowling for a Buck. 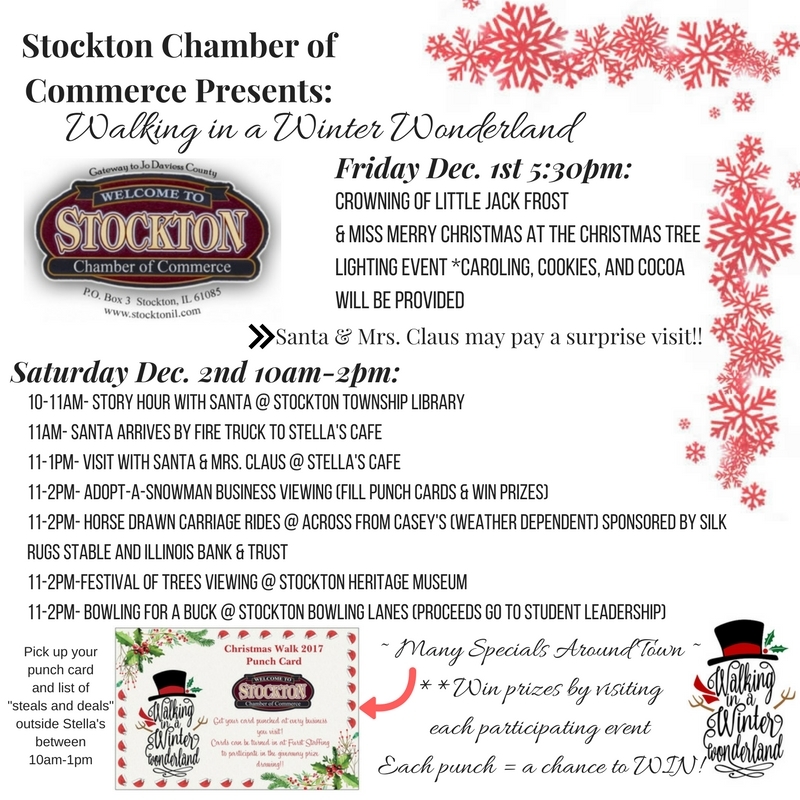 The village of Stockton is a must stop for all of the small town holiday feels. Join in on the holiday fun in Platteville, WI on Saturday, December 2, 2017, with everything from craft fairs to carolers. Carolers will be singing up and down Main Street as you shop the latest crafty deals and drink hot cocoa all day long. Keep a lookout for the Grinch, as he will be cruising his bike through town. No Christmas is complete without a holiday show. Catch the final weekend of It’s A Wonderful Life at the Grand Opera House in Dubuque December 1 – December 3, 2017. An evening at this theater nestled in historic downtown Dubuque is just the ticket to start the holiday season off right. © 2019 Copyright Tri-State Tourism. All rights reserved.